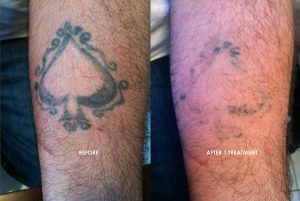 Laser tattoo removal is much more comfortable than other methods of tattoo removal such as dermabrasion or skin graft surgery. Laser tattoo removal also requires minimal downtime. You can return to your normal activities within minutes. Repeated use of lasers removes colors more effectively than other methods, since each wavelength of laser light is targeted to a specific color. Old tattoos can be reminders of an unpleasant memory or relationship. When removed, they allow you to move on. Tattoos can distort, sag, and fade over time. 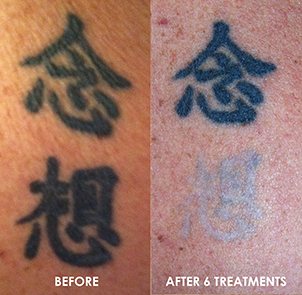 Removing tattoos that are no longer aesthetically pleasing can improve your appearance. You may be ineligible for certain types of employment (or roles, if you are an actor) if you have a tattoo. Removing it can open doors. Whether it’s for a job interview, an acting role, or you just can’t stand to see your ex’s name anymore, laser tattoo removal can be accomplished quickly and easily. Dr. Aldridge is looking forward to assisting you. For quicker response and service, please send us your tattoos and book an appointment.